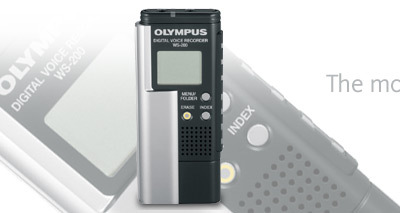 Olympus digital recorder not intended for dictation but for recordering light meetings or a note taker. Includes docking station, USB cable, Basic download software. Olympus digital recorder not intended for dictation does not have removable memory or download software but has USB connector. Record up to 55 uninterrupted hours in LP mode so you never miss a beatâ€¦or sound. 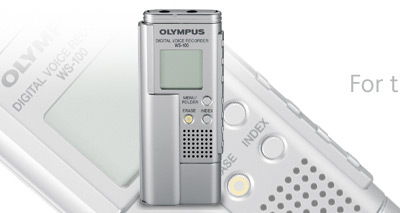 Olympus digital recorder not intended for dictation does not have removable memory or download software but has USB connector. Take the WS-100 anywhere with its compact design and record up to 27 hours of uninterrupted sound in LP mode.